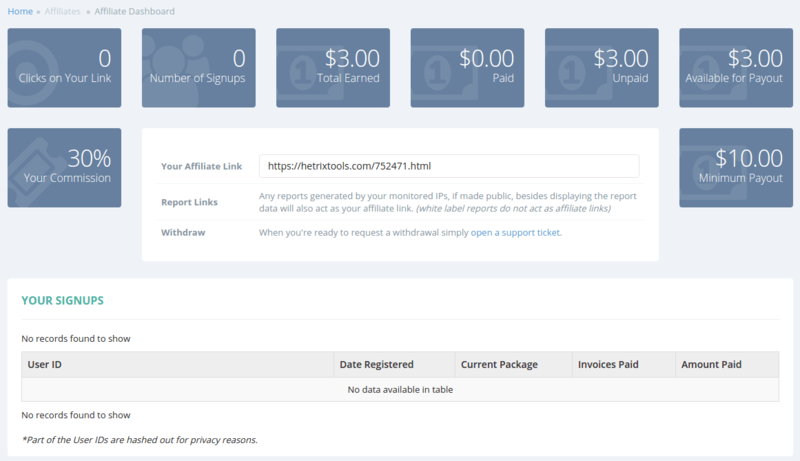 You can access your Affiliate Dashboard at any time from the top menu in your client area. The affiliate dashboard contains all the information you need regarding your earnings. The sums in the “Unpaid” and “Available for Payout” may differ, because as soon as one of your referred clients pays an invoice, 30% of that invoice will be added to your “Unpaid” balance, but it won’t be available for payout yet. We hold all commissions for 1 month before it becomes available for payout in order to prevent fraud. Once a month passes by, the sum will be added to “Available for Payout”, as well. In the middle, you’ll have the widget containing your unique affiliate link. This is the link you will need to share to refer clients to our platform. Aside this unique referral link, you can also share any of your public reports. They will act as referral links while, of course, displaying the report data. The last panel in your affiliate dashboard will contain a list of all of your signed up users. Here, you’ll be able to see when they signed up, their current package, invoices paid, and the total amount they paid.